In 1989 Disney released a little underwater gem of a film that went on to become one of its most popular musicals. Now almost two decades later, composer Alan Menken revisits his hit show, revamping many of the favorites and writing 10 new songs. The result is now a larger-than-life Broadway version of The Little Mermaid. Recorded in the same studio that the music forÂ the original film was recorded in, this original broadway cast recording has a similar jump and pizzaz, while also adding a nice live action feel. With 29 tracks and a slightly reworked storyline (Ursula and Triton are now siblings) audiences are in for more than a simple cheap reworking. Under the direction of Francesca Zambello (The Little Prince, Cyrano de Bergerac) and musical direction of Michael Kosarin (Little Shop of Horrors, Beauty and the Beast) the album captures the stage production’s life and vitality ensuring that fans of the Broadway show will be captivated with the album while fans of the film who haven’t yet seen the showÂ are likely to be won over by the catchy new songs and impressive performances. And there are a few standouts in the cast: Sierra Boggess is tremendous as Ariel, sounding enough like the original Ariel (Jodi Benson) to invoke a sense of nostalgia for fans of the original while still staking out her own territory. Ariel also has a few new songs, whichÂ doesn’t hurt: the slightly cheesy “If Only”, and the introductoryÂ “The World Above”). Additionally, Sherie Rene Scott completely recreates Ursula as a snide, cosmopolitan sea-witch. Her new song “I Want the Good Times Back” allows audiences a bit of back story while also introducing us to a 21st century Ursula. As a fan of the film soundtrack, I was admittedly hesitant to pick up the new album and give it a listen (especially after mixed reviews of the stage version), but this album manages to walk a fine line between paying homage to the original and updating it for a new audience. There’s a bit more adult humor (lines like “the squid will hit the fan”) and obviously a lot more music. But both these changes are welcome additions. Any fan of Disney and Alan Menken (recently receiving several Oscar nominations for his Enchanted songs) will find more than enough to like on this album. 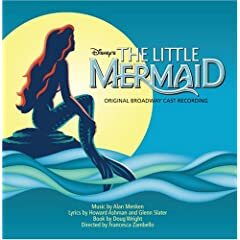 1 user commented in " CD Review: The Little Mermaid Original Broadway Cast Recording "
And how about that kid who plays Flounder? He can SING like nobody’s business!